Our final podcast of 2017! Over the past few weeks, Elk & Knoxy have been giving you a behind-the-scenes look at the shooting of our Player Channels and access to some of our newest Secret Golf signings. This week, Steve tells you exactly what a Player Channel shoot consists of and how our instructional videos will help you improve every aspect of your game. 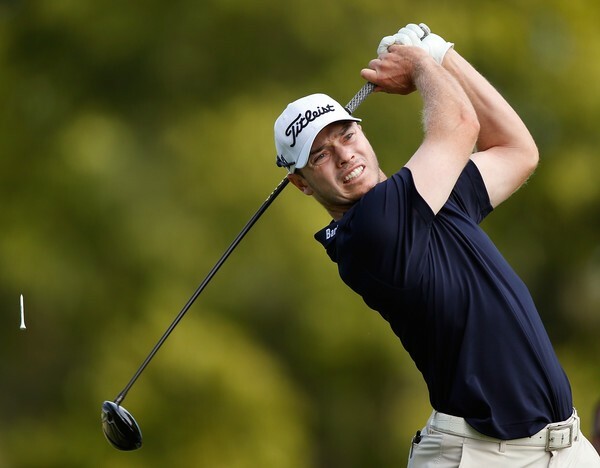 We're joined by Bronson Burgoon as he discusses his recent journey from the Web.com Tour to the PGA Tour. Hear Bronson talk about recovering from injury, the importance of his workout routine and what he hopes to bring to the Secret Golf table. In addition, Elk talks about why Bronson is going to give the big power hitters a run for their money in 2018! [MUSIC - "SECRET GOLF THEME"] [SINGING] It's Secret Golf. It's what I'm looking for. It's why I get up every morning. Oh, my good time with friends. It keeps me coming back for more. Secret Golf. We're headed down the road. We just loaded up the big show, going looking for the heart and soul. Rolling until the wheels fall off, it's Secret Golf. Shh, it's a secret. Hi, and welcome to another Secret Golf podcast with Elk and Knoxy, the final one of 2017. I can't believe Christmas is next week. I don't know where the time has gone, and I feel completely disorganized when it comes to getting prepared for Christmas. Well, that's fine. I got Elk his bourbon as his gift, and that's all he needs. That's the most important person to take care of. Anyway, so we've been doing a series of podcasts over the past couple of weeks, going behind the scenes on our Player Channel shoots. The first one was with Martin Piller. Last week, we featured Chris Stroud's. And I want to talk about him just in a few minutes, actually. And this week, it is Bronson Burgoon-- fantastic name. It's going to be my favorite name to say out of all the Secret Golf players. A few weeks ago, we shot their Player Channels in Texas. You're going to get to see them next year at some point. But I'll keep you updated on that when it's happening. But we just wanted to do this series of podcasts to show you what goes on behind the scenes at Secret Golf, what we're actually hoping to achieve, how we work with the players. And of course, we will hear it from the man who is there with them every step of the way. Elk's on all the Player Channel shoots. And that's what makes Secret Golf a little bit different, is what you're seeing, the golf instruction you're getting, is peer-to-peer. It's Elk working with that professional golfer. And they're breaking down every bit of their game, explaining it in detail. So it will help you get better and lower those scores, hopefully lower the handicap, too. Now, I did say I wanted to talk about Chris Stroud because, last week, he held a fundraiser for Hurricane Harvey. Now, what he set out to do-- because he's from Houston. He lives there with his family. He was away playing when the hurricane hit. But a lot of his neighbors, a lot of his friends, they were really affected by the absolute devastation. And they lost their houses, their furniture, pretty much all their worldly belongings. So he wanted to organize this golf outing at Bluejack. And he did it last week. He had so many professionals there. Elk was there. Ryan Palmer, Patrick Reed. I mean, the list goes on and on. And they raised over a million dollars, which is unbelievable. We've got loads of pictures. If you go on the Secret Golf Twitter and on Elk's Twitter, too. But a massive well-done to Chris Stroud and all the team that helped organize the outing. But just a huge effort and that money is going to make just an enormous difference to them, especially in the run-up to Christmas. So why do we do the Player Channels? What are they all about? What actually happens on the Player Channel shoot? As I said, we'll be joining Bronson Burgoon shortly. But first, well, the best person to explain what actually happens is Steve Elkington. And I've got him on the phone right now. So Elk, you know we've been busy with shoots lately with Martin Piller with Chris and with Bronson. But what actually goes on? What does the day consist of? Well, it's a good question because it's important. And it takes a lot of planning to do, what we do in a shoot. We are building a complete matrix for golf instruction. So all the things that people need to break 100, all the curriculum for 90, 80, and 70s, inside of that matrix is every question that can be asked about golf. How do you grip it? How do you-- all the different questions. And what we do, we take our players and we change it up for them. They might do some beginner videos, and they might do some intermediate videos. And of course, they'll be doing the expert videos. So at the end of it all, you could be a 100 shooter, press a button. How do I get out of the sand? It could be Jason Dufner delivering the most basic how do I get out of a sand video for someone that's trying to just start. Press another button, could be how do I spin my 40-yard wedge shots more? That would be an expert video. And it could be Ryan Palmer or Stacy Lewis. So we run the matrix. So we put our players all the way through the-- we sprinkle them everywhere, almost like a checkerboard, up and down, across all these different categories. And we come up with about-- probably we saw about 70 videos per player. So we'll adding another exciting over 200 videos just on this week to our-- probably another 21 hours of footage-- to our library. But most importantly, it's organized. And it's in its right spot, ready to be found, essentially, or delivered, in this case. Yeah, exactly. I mean, think about it. That way you could be on the course. You could be on the range, and you could have this customized golf instruction delivered to your phone. It's amazing. So if you go to secretgolf.com, the Player Channels that we have for you on the website right now-- Pat Perez, Jason Dufner, of course the Elk, Stacy Lewis, Jackie Burke, Bradley Hughes, Gerina Pillar, Colt Knost, Jason Kokrak, Ryan Palmer, Brittany Lang, Gaby Lopez, and Jason Gore. Coming at the beginning of 2018, we're going to give you Brian Harman and Patton Kizzire. So I'm actually working on the Patton Player Channel right now. And you're going to get that at the beginning of the year. He just won the OHL Classic in Mayakoba. He's actually leading the FedEx Cup standings heading into 2018 with Pat Perez, another one of our guys, in second place. So that's exciting. And then, of course, for the series of podcasts, we shot Martin piller, Chris Stroud, and Bronson Burgoon. So you can go and subscribe at secretgolf.com. We've got a little offer on right now in the run-up to Christmas. But today, we are talking to Bronson. Now, he said that his journey to the PGA Tour has been a wild one. He played Web.com last season. And now he's received his full card for the PGA Tour. He's been recovering from injury, and you'll hear Bronson talk about it. It's been very up and down for him, especially with injury. But this guy is ready to go. Bronson's on the phone right now. How are you? I'm great. Thank you. Very good. It's great to have you on board the Secret Golf team. So thank you for being part of it. I'm glad to be a part. So you're with Elk right now. And you guys have been doing some of your Player Channel shoot this morning. I know that you're going to have lunch, and then you're going to do the second half. So first of all, set the scene. Tell me where you are and what you've been doing so far today. Yeah, so we're at Carlton Woods in The Woodlands, Texas. It's an awesome golf club. And we have been doing full swings, short game, chipping, just about everything as far as golf goes. We've kind of taken video of everything and just discussing how I do it, why do it. It's great to have you as part of the Secret Golf team because, well first of all, you're 30 years old. You're 6'2", turned pro in 2010, went to Texas A&M. And this year, you finished 19 on the Web.com Money List, which gave you your PGA Tour exemption. So I guess right now, you're still kind of riding that wave, and it must be a really exciting time for you. It is. I'm coming off an injury. I was out for almost a year. And it's good to be able to come back and play well enough to get back on the PGA Tour. It's a lot of fun, and it's going to be a great holiday season. And then I'm ready to get back to work starting January. And now, the thing is, you finished up fourth at the Web Tour Championship, then went straight into the Safeway Open, tied 17, top 20, finished straight away. Obviously you want to kind of keep that momentum going after you have your Christmas break. Yes. Yeah. So it was a shame, I actually broke a rib after Safeway. So I tried to muscle through it. I was in quite a bit of pain. And so the last event was the first one I was actually able to play with not much pain at the RSM at Sea Island. But yeah, I'm hoping to pick up right where I left off before I got hurt. And it's going to be a great new year. How did you break your rib? Honestly, I don't even-- I had the flu, and I was coughing. But I don't think a cough can actually break a rib. And then I think I got back into my workouts a little too fast. And I put a lot of strain on the right side of my body holding up a kettlebell. And I think I might have just had like a hairline fracture or something. Yeah, it wasn't fun. And it was pretty painful. Oh my goodness. You're talking about doing your workouts late and stuff. Is your working out schedule a huge, huge part of your golf practice, so to speak? It is now. I really lack flexibility and core strength. So I've been working a lot on that. And it's really helped me with my golf swing to be able get to some places in my swing that I haven't been able to in the past. So it's been really good. Now, obviously you, being one of our new signings to Secret Golf, and you've done half of the Player Channel shoots so far-- we're going to see your Player Channel next year when we get it live on the website. So far, what would you say has been your strength when it comes to talking about your game? For me, I'm really athletic. So it's hard for me to articulate like what I'm doing. But I think I'll be able to help people understand that they don't need to get real technical to be able to enjoy and get better at golf. So if I'm bringing something to the table, I would say that would be it. And when it comes to your game, in general, what would you say is the strength of your game right now? Driving the ball is usually my strength. And I'm usually pretty good off the tee and iron play is pretty good, too. So yeah, that's always been my strength. And anything today that you've been working on so far and showing Elk that he's maybe giving you some pointers on, some tips, because he's very hands on. He likes to get really involved. Yeah, I'll tell you what, we talked about chipping and he showed me a couple of things on my chipping that I think I'm really going to be able to use and be extremely beneficial going forward. So I'm super excited about that. So that happened right in the middle of the shoot while we're doing chipping. So it's been awesome. He likes to keep it very natural. So if something comes up halfway through the shoot, he's like, no, we're going to talk about this. Is there anything that he's been watching you doing where he's like, I never thought about it that way. Show me that again. And maybe you're teaching him something a little bit different. No, I don't think so. I think he's been around the game so much longer than I have. And I think he's probably seen every which way to do it. So he's so knowledgeable about golf and golf mechanics that I don't think there's anything that I'm going to be able to show him at this point. You can teach the PGA champions something. Now, when Elk-- obviously, you're from Texas. You live in Texas now. When Elk first spoke to you about Secret Golf, what was it about it that made you want to be part of it? I've obviously grown up in Houston. You hear stories of Elk, and just to be around someone that's accomplished so much, it's always a good thing. I listen to the stories, and then having the advice given to you from someone like that is invaluable. I mean, you can't put a price on that. So that part alone made me want to do it. It's really fun. And the other side of it is you have to think that people that are visiting secretgolf.com and checking out your videos, they're in the same position that they want to learn from the pros. They want to know exactly what you guys think, how you feel, the mechanics, every single little bit that makes up the fundamentals of your swing. Yeah, and I think what they're doing is just awesome. I mean, I think it's such a great idea because it's just like anything else. You want to see what the best are doing. And obviously, being on PGA Tour, that's what you are. And I know it's going to be huge because if I won on PGA Tour, I'd want to know what the guys are doing on the PGA Tour that makes them successful. If you had someone that came to you right now and, say, they're a high handicapper. What is the one bit of advice that you like to give people straight off the bat? I would say just I feel like with golf, you can get so frustrated and tense. I would just relax the grip, a little bit more fluidity. I've got a lot of buddies that I play golf with, and sometimes they just get really rigid. And if you can just stay fluid, even when you hit a bad shot, it's not going to be quite as bad. So that would be my one piece of advice I'd give somebody. We always say that what we're doing with Secret Golf is it takes away the intimidation factor, as well. I mean obviously when you're playing with your friends, you can give them advice. And they can ask you questions. When you're playing in pro-ams, do you ever notice that the amateurs can be a little bit intimidated? Or do you feel that they relax a little bit more around you when you're out on the course? I would say on the back nine that's when they start opening up and asking questions. And sometimes before that, I'll just kind of jump in there because you can tell when someone's struggling and wants to know something, why they're doing this. So I think Secret Golf is going to be perfect because you can go on your own time. And you can watch the video, and then try it on your own. And no one's watching. You're not around anybody. Yeah, that's awesome. Talk me through a little bit about your journey from playing golf at Texas A&M to actually getting on to the PGA Tour. Yeah, it's been a wild one. So when I graduated in 2010, I ended up breaking my hand, and I was out for a while. So I didn't really start playing until 2011, and I spent a year and a half down in South America playing on the Latin America tour, finished high enough on their Order of Merit to get to the final stage of Q-school. And then I finished top 10 at finals and played two years on the Web and graduated on my second year. And now I'm on PGA Tour. And I was out for 10 and 1/2 months because I tore a ligament in my wrist. So I'm falling apart piece by piece. That's why I've tried to get a little bit more in the gym. And I used to just try to rely solely on my athletic ability and my genes. So now I'm trying to actually get in the gym and make sure that I'm a little healthier so that I can try to prevent what's been going on. Yeah, stay healthy and don't break any bones. Exactly. Right? My wife's calling me Glass Man. [LAUGHING] Apparently I'm extremely fragile, which I'm finding out. OK, well, we need to wrap you up in cotton wool when you're not playing golf. Exactly. So what have you guys got lined up to do to finish off your Player Channel shoot this afternoon? Yeah, so we're going to grab some lunch. And then I think we're doing an interview. And then we're going to go on the golf course. A little bit of strategizing. Well, Bronson, thank you so much. It's been really good to talk to you. And again, we're delighted that you're part of the Secret Golf team. We're excited to see this Player Channel and really see where your Player Channel is going to take us. Well, I sure appreciate it. Thank you so much. It's good talking to you. So Bronson Burgoon-- as he was saying there, he's been plagued with injury over the past couple of years. His career's been a little bit stop-start. But now, after finishing 19 on the Web.com Money List for 2017, he's got his PGA Tour exemption. And this guy is going for it this year. Absolutely, he's going for it. I'm sitting here, just finished a morning session with him, shooting this morning, and I've never in my life seen anyone with this much horsepower in his swing. It is something when you're standing next to him. It is amazing. So he's been tagged as a gun player, and like you said, his engine broke a couple of times-- wrist, another wrist, rib. And I try to remind him that while he was going through all this struggles, he was still going up. So he was on the Latin American tour, hurt. Comes back, gets hurt. Now he's on the PGA Tour and healthy. So very unusual, Diane. It leaves a very, very important footprint if you're hurt and not playing well, and you're going up. Then, what's going to happen when-- of course, he's healthy as he is now, what is going to happen for him? That name right there, do not forget that name. Bronson Burgoon. You can't really forget that name. The way you say it-- nobody could the way you say it. That's a tongue twister for you. It's those hard Scottish As and Rs. Now, I told you at the beginning I'm going to enjoy saying his name a lot. Thank you so much for listening to our Secret Golf podcast, well, not just this one but all of them. And you can subscribe on iTunes if you haven't done so already. We launched the podcast a couple of months ago now. We've done 20 podcasts. So it's been brilliant, and we're definitely going to continue it into 2018, obviously. Have a very Merry Christmas and, of course, a Happy New Year. We'll be back in 2018. As I said earlier, we're going to be launching our Brian Harman and Patton Kizzire Player Channels at the beginning of the year. And then, of course, the golf gets going-- in Hawaii for the guys the Tournament of Champions and the Sony Open. And then the end of January, the girls start their season on the LPGA in the Bahamas. So really excited about it. It's going to be a fabulous year, and Elk and I will be back with you then.